Dental implants are designed to provide a foundation (root) for replacement teeth that look, feel, and function like natural teeth. By replacing missing teeth with dental implants, a person regains the ability to eat virtually anything and can smile with confidence, knowing that teeth appear natural and that facial appearance will be preserved. The implants themselves are tiny titanium posts that are placed into the jawbone where teeth are missing. 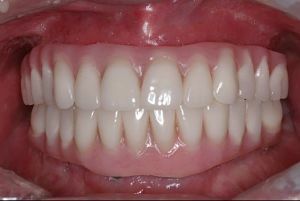 The bone bonds with the titanium creating a strong anchor for the artificial teeth (crowns). 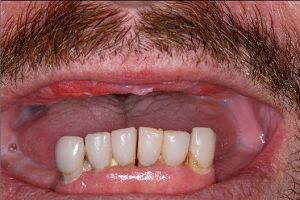 In addition to a repaired dentition, placement of implants can help preserve facial structure by preventing deterioration of the jaw that occurs when teeth are missing. Danny came to our office missing all teeth in the maxillary arch and his lower remaining teeth failing. Dr. Kolinski extracted the remaining lower teeth with immediate implant placement on both the maxillary and mandible arches. The final restoration was a fixed profile. Our practice is focused on implant dentistry. Our doctors have received extensive training in implantology. We have been successfully placing implants since 1986. Through continuing education, our doctors have kept at the forefront of the most current information available concerning implant dentistry. We has been invited to lecture on the subject by many groups including the Chicago Dental Society, the Academy of General Dentistry, and the American Academy of Periodontology. Having placed over 12,000 dental implants, we use our experience to work closely with many restorative dentists to attain consistently good results for patients. Because of these close relationships, we can draw on the experiences of the patient's restorative dentist, and the restorative dentist can predictably rely on our surgical experience. These collaborative efforts give our patients the benefit of the best that each dentist has to offer. The more challenging the case, the more important this relationship becomes. Separate offices working closely together create a smooth appointment flow for each patient through the completion of their treatment plan.